The crucial role of the private sector in achieving the Sustainable Development Goals (SDGs) and the Agenda 2030 is clearly recognized and continuously stressed as essential means of implementation by moving from "billions to trillions" of development investments from all sources. Since the adoption of the SDGs, the Global Compact Network Canada has conducted a nationwide survey and numerous SDGs workshops to get the gist of where Canadian businesses stand when it comes to the new global goals and Agenda 2030. The Canadian private sector is embarking upon its responsibility and exploring the SDGs. The Global Compact Network Canada, the Canadian network of the world's largest voluntary sustainability initiative, the United Nations Global Compact, conducted a survey shortly after the adoption of the global goals in September 2015 asking Canadian organizations to rank their SDG priorities. 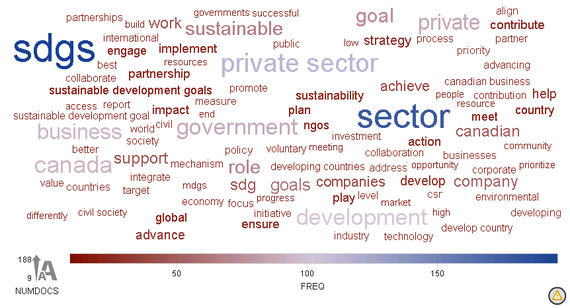 While you are probably used to a picture of the 17 SDGs in their familiar order, this chart shows the combined results of top ranked goals in the four categories. To see the full results and analysis please read the SDGs Survey Report on the Global Compact Network Canada's website. It is no surprise that SDG 8 "Decent Work and Economic Growth" is the clear frontrunner being ranked as one of the top priorities for every question. Furthermore, as shown by the Global Opportunity Report, this result does not only apply to the Canadian private sector but also to North America as a whole. But where are "Gender Equality" or "Partnerships" in these pictures? With 17 Global Goals, all of utmost importance, it is hard to single out a few goals as top priorities. However, it is surprising that some goals were ranked very low in the survey, possibly due to a lack of knowledge around the goals' targets, initiatives, and what they entail. For example, SDG 16, "Peace, Justice & Strong Institutions," includes issues of transparency, anti-corruption, and promoting the rule of law. 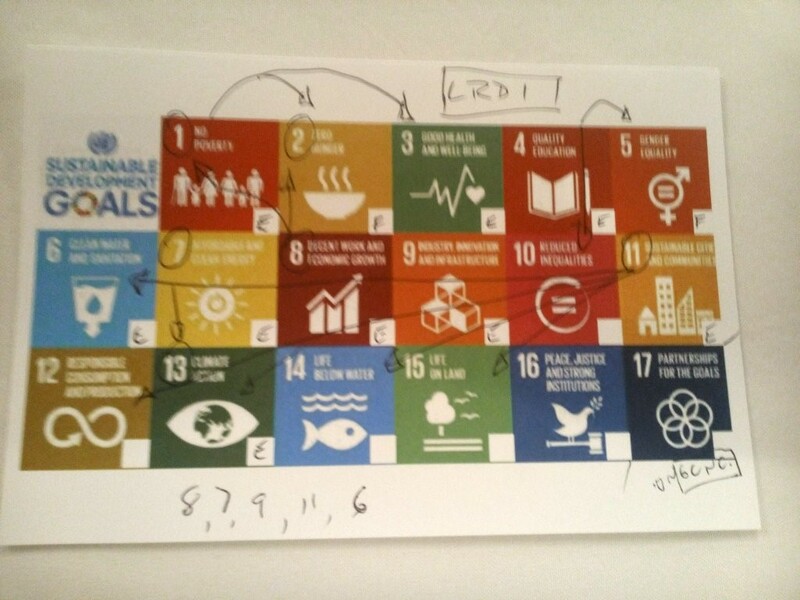 However, these sub-focuses of this SDG, as well as many others, might not be recognized when only reading the title of the SDG icons. It is therefore the objective of Global Compact Network Canada to increase awareness around the Sustainable Development Goals and what they constitute. Despite the challenges that come with the SDGs, many Canadian corporations see the opportunities and big rewards awaiting them when taking the lead in sustainable development. 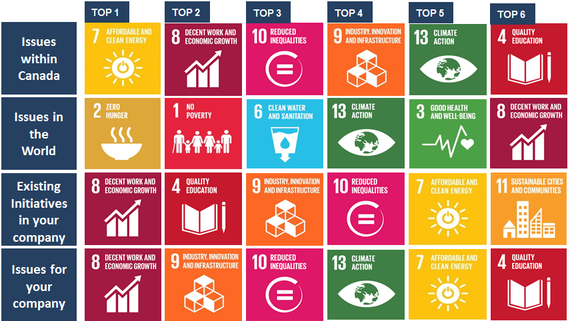 Most importantly, these Canadian businesses do grasp the linkages between the global goals. Through a holistic and sustainable approach, an effort in achieving SDG 8, "Decent Work & Economic Growth," leads to SDG 1, "No Poverty"; which then has an impact on SDG 2, "Zero Hunger," and SDG 3, "Good Health & Well-Being." In the same manner, advancing SDG 4, "Quality Education," would lead to outcomes for SDG 5, "Gender Equality," and SDG 10, "Reduced Inequalities." Many more connections are shown in the SDG postcard below analyzed during the GCNC SDG Workshop before the start of the GLOBE 2016 Conference in Vancouver earlier this month. However, many questions regarding the role of the private sector and the business case around the SDGs remain. 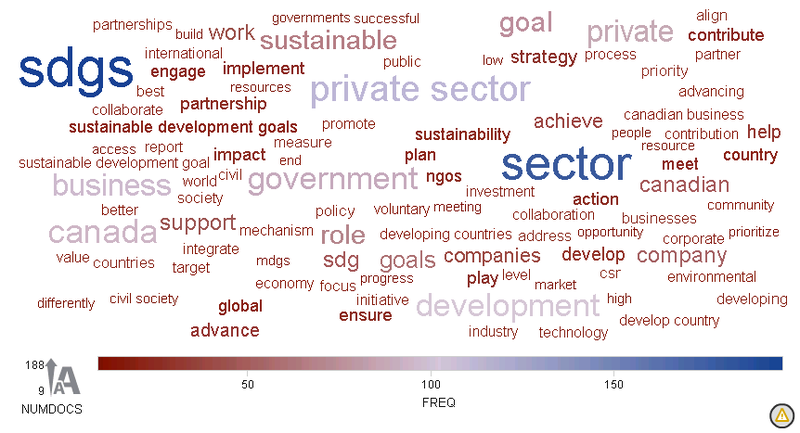 Prior to a National Roundtable, co-hosted by the GCNC and Global Affairs Canada, more than 300 questions were submitted by different Canadian stakeholders to be asked during the event which clearly reflect the interest of the private sector in the global goals as well as the ambition to take action. Questions included topics such as general perspectives and priorities of the SDGs, the value proposition for Canada, roles of the different stakeholders, potential partnerships, as well as very specific aspects regarding the impact of the SDGs for certain sectors and industries, and specific SDGs and their influences for example on the supply chain. This cloud mapping image below captures an overview of key terms used in the questions. 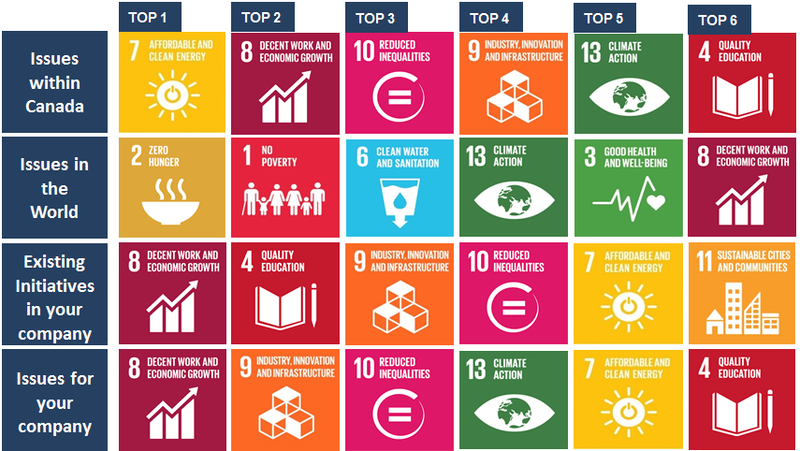 What remains clear is that a large part of the Canadian private sector has embarked on setting its priorities and navigation through the Sustainable Development Goals. However, a special focus needs to be put on making the business case clear to SMEs, and forming innovative partnerships to get everyone on board. Time for action! The views expressed in this blog are those of the authors, and do not necessarily reflect the positions of CCIC or its members.